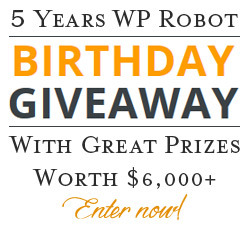 The autoblogging plugin WP Robot becomes 5 years old this month and to celebrate they have launched a huge birthday giveaway. Everyone can enter for free to win one of 40 prizes with a total value of over $6,000. Among the prizes are many top internet marketing products like Article Builder, WordAI and Kontent Machine.